Why Paper Prescriptions Are Going The Way Of Snail Mail : Shots - Health News Medicine's shift from paper to computers has been painful and expensive. But now doctors can easily write and transmit prescriptions by computer, saving money and improving the quality of care. Charlie is like a lot of my patients. He's in his late 50s, weighs a little too much and his cholesterol and blood pressure are both too high. To lower his risk of a heart attack or stroke, he takes daily pills to control his blood pressure and lower his cholesterol. A couple of times a year, Charlie visits me to make sure the drugs are working and aren't causing problems. Caring for patients like Charlie has become easier in the last few years because of something that you might take for granted in 2014: electronic prescribing. When Charlie needs a new medicine or a refill of an old one, I send the prescriptions to his pharmacy right from my computer — the same one that has replaced the paper medical records we used to use. 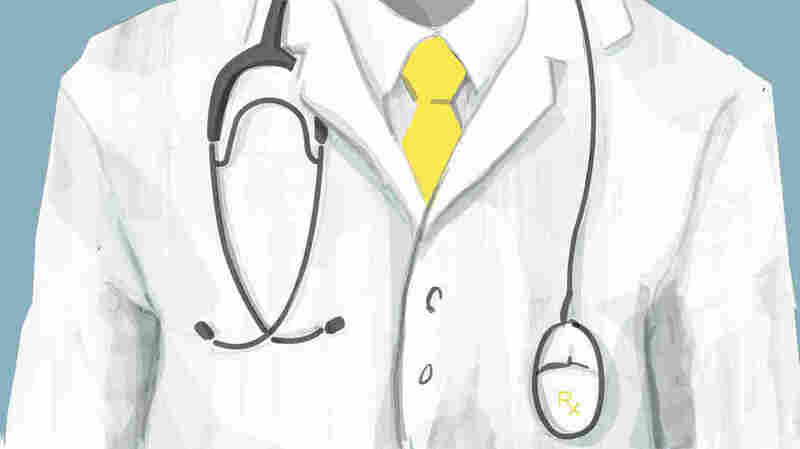 My ability to prescribe his medicines electronically is a bright spot in what has been a painful transition to computerization in health care. E-prescribing is no small feat. It requires that nearly every pharmacy in the country be networked. And the drugstores' computers have to be able to talk the language of scores of different electronic medical record systems in use, none of which look or work exactly the same way. For prescriptions, computers make a world of sense: Doctors and other prescribers can choose medications from a menu rather than having to remember the names and proper dosages. With patents' insurance information, we can figure out right on the spot which medicines are the best deal for them — no more drugstore sticker shock. The computer also alerts us to risky complications from combinations of drugs. And some other problems with paper prescriptions are eliminated, too. Errors caused by lousy handwriting. Plus, you don't have to worry about losing a prescription or never getting around to taking it to the pharmacy. About 1 in 4 paper prescriptions go AWOL. All of this has come to pass in a little over a decade. A Virginia-based company called Surescripts (and its predecessors) made it happen. Surescripts is run by a consortium of pharmacies (think big chains like Walgreens and CVS, as well as small independents) and companies like Express Scripts that manage drug benefits. Besides building a secure national electronic prescribing network, Surescripts made sure that it would work with more than 600 different styles of electronic medical records so that virtually every doctor's office, whether large or small, could participate. With the massive adoption of electronic medical records in the last few years, e-prescribing has reached a critical mass. In 2013, half of all prescriptions filed were transmitted electronically over the Surescripts data network. "It's a huge health IT success story for a small but crucial part of the medical universe," says David Yakimischak, executive vice president of Surescripts, who also serves as general manager of the company's prescribing network. Yakimischak says that in addition to improvements in convenience, safety and reliability, e-prescribing has an additional benefit that doctors love: the rate of unfilled prescriptions drops by 10 percent. But does all this convenience add to our national health bill? Quite the contrary. In the case of Surescripts, neither the consumers (patients) nor the main users (doctors) are charged for transactions. All costs are borne by the consortium that created and runs Surescripts, in relative proportion to their share of traffic on the network. "The efficiencies gained in time saved alone pay for the network's costs," Yakimischak said. For all the success Surescripts has seen, there are critics. Data journalist Fred Trotter, author of the book Hacking Healthcare, describes Surescripts as "a monopoly, in all the worst senses of the word. They ensure a continuous drag on innovation. Mostly they are really slow. Slow to approve changes.... [and] slow to respond." Surescripts sees itself more as a utility that's operating for the good of the health system. "We don't use our size for economic leverage," Yakimischak says. "We are always open to making things better. We welcome people coming forward with possible solutions or improvements." I know that my patient Charlie and I benefit from Surescripts. For me, his prescriptions go seamlessly into his electronic medical record, and I can see how good a job he's doing at taking what I prescribe. For him, his refills are quicker and easier to get, and they're safer, too.